Have you ever noticed some students leave during lunch? Have you ever been someone who says, “I wonder if I can leave?” Well, you’re not alone. The Prowl took a few moments to explore the on/off campus policy to help students navigate one of the murky rules and procedures of this campus’s big questions: Can we leave the school campus? Though many students are not familiar with our off-campus policy, they tend to want to go off campus for lunch. After asking many students and teachers about the procedure, several of them are not aware of the off-campus lunch policy, which causes frustration amongst the student body. We also have discovered that it’s not just students that are unaware of the off-campus policy. WRHS teachers and staff are not familiar or confident in reciting the rules governing the system. So, clarification of the off-campus policy is as follows: Weston Ranch off-campus policy is only for juniors and seniors who meet the qualifications. Before students can get the off-campus lunch pass, their attendance, behavior, and grades must meet the approval of the administration. Also, all detentions, Saturday schools, and fines must have proper clearance with the office. Once this is approved, students need to fill out a request to leave form. After students turn in their request form to leave campus, parents must call the school so Ms. Hayden (one of our VPs) can approve it. Students who can leave campus must have their ID cards and a pass before going off campus. If students abuse their privileges, they can get their pass revoked by the administration. 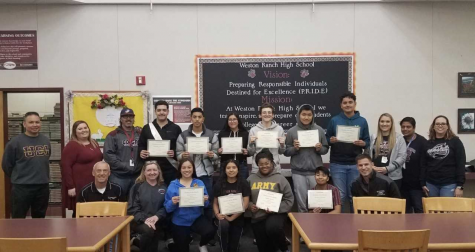 We hope that this clears up any confusion regarding the Weston Ranch off-campus policy.